So much texture on the page, I want to reach out and touch it. The steampunk tag is great. I really love that bird head. Autumn looks a little further along at your house. Trees here are just starting to turn, and we're still enjoying Summer temps. for the next couple of days. More seasonal weather predicted for the weekend. Feel better soon. Oh how lovely your art is! I hope you feel better soon. The photos of the trees changing colors are so very pretty. This is a fabulous mixed media page Valerie, all the detail, materials and your stitching add to its beauty. Thank you for making another great page for AJJ and for all your support for my theme this month. I loved your Steampunk tag as well and the photos looked lovely , beautiful colours of autumn. Keep warm and I hope you will be feeling better soon when the tablets have time to start working. glad you know it's bronchitis and got the antibiotics. Beautiful piece for AJJ and a lovely tag. Nice to see the fall leaves coming in. Fabulous artwork and photos as well!! Take care of yourself and get well soon!!! Beautiful card, Valerie. Original and with many great details. I also love your pretty card. The crowned bird is adorable. As for your photos, they are amazing. I love the bird nest! I hope you feel better soon. Kisses, my friend. I love the bits of texture and fibers! 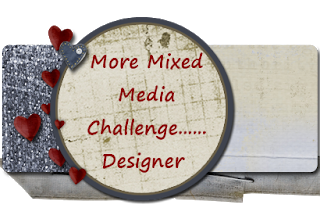 I so love ALL your mixed media pieces..and your bird tag. I am so sorry to hear you have bronchitis but I hope you are able to relax and enjoy your rest time. Recover soon! I wish you could, too....Thanks for the nice thought! Wonderful textures on the mixed medium piece!!! I am so sorry to read you are still not well. This is certainly not the time of year to get ill. I'll be sending virtual hugs and hot cappuccino. Bed rest is best and the greatest medicine you could give yourself right now. I was admiring your lovely journal page when I realized I have that da Vinci face stamp. My friend Kathy gave it to me. I don't think I've ever used it. You have certainly inspired me to get it out and use it. Your journal page is wonderful with lots of extras beside the stamp. I think you must like that steampunk theme. I've yet to see if there is something I can come up with that might work. That is a darling tag. Autumn is really showing itself in your world. The trees and their lovely colors are true signs of this. So glad you have an internet connection for your bed. I can't take my desktop computer to bed with me, so at least I know YOU will have company and you can surf the net as you rest and get better. Do hope you recover my friend, not good being ill.
Beautiful page for AJJ -thanks a bunch- and an amazing tag! Take good care of you and recover soon. I’m so sorry that you’re not very well at the moment, I wish you a speedy recovery. Beautiful art and lovely photos. beautiful photos-this morning we finally feel like autumn has arrived-I hope the weather stays. Your art is always so wonderful! Hoping you bronchitis clears us soon-I woke up with asthma issues today-do to the big weather change so I know how you feel. abstrakt dein Journal da sgefällt mir auch sher gut mit den Federn und genähten und der Tag ist ja süss ich liebe diese Figuren darauf! Ja, jetzt ist es auch bei dir herbstlich geworden trotz dass es was wärmer ist bei dir! Tolle schöne Fotos sind das! 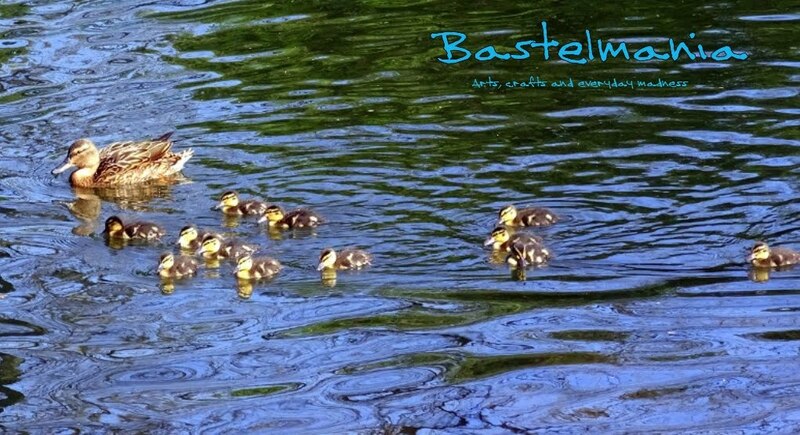 Wonderful artworks, and I love your Autumn photos Valerie! A lovely page Valerie and I love the steampunk tag and sentiment. Beautiful Autumnal photos, colours look fabulous. Hope you soon feel better - Take care. I am so sorry to read you are not well. I wish you a speedy recovery, Valerie! Both creations look gorgeous and I love your photos as usual...especially the second one! I'm so bummed about your bronchitis. Been there, had it and it can be downright miserable and hard to kick. I'm glad you feel well enough to create but do get plenty of bed rest and all those things they tell you so you can get out and take more lovely photos of your fall to share with us! I truly love both your pieces!! They are so beautiful and so fun! WOW! I have mixed feelings here. I am sorry you have taken to bed with your bronchitis, but I am happy you are staying in bed to give yourself needed rest and relaxation to get better! Do you have someone to make you tea or chicken soup? I would if we were neighbors ") Please feel well- sending you good health wishes! 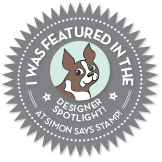 oops, Your golden piece is gorgeous and another fine steampunk tag! 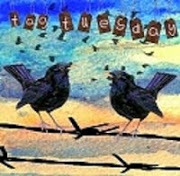 Love the ephemera on this artwork and your quirky clockwork birds are so fun...Again feel better soon!! Hope you're feeling better, Valerie. I just love the clockwork bird on this tag and the brilliant quote! Your autumn colours are brilliant. It's always such a treat to see your projects and I love the wide variety of artwork styles that you create. I really love the texture you were able to achieve in these pieces and I adored all the beautiful pictures of Fall that you included! Your posts are a constant feast for the eyes! 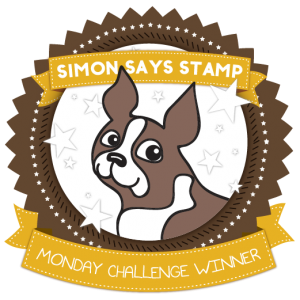 Hope you get to feeling better soon and I'm so glad you shared these pieces with us in the meantime for this week's Simon Says Stamp Monday Challenge!